Complaint: Dch of simi valley Ca. I checked a add on a leader car. They said that it was available i told them i was 40 minutes away but did not have transportation getting there because my wife can't drive freeways but if i checked and they had another sale i would have my daughter who is 40 min from me ,come and take me there to purchase it. Three days out of the following week i was told they would have the car a red corolla. The night before the sale a manager contated me and told me it would be available. I told him i would contact my daughter to pic me and my wife up and we would meet at between 12 and 1 0'clock and was told that was fine. So the day i was suppose to go and pick it up i called and told him i contacted my daughter and she would take us to pick it up and wanted to know that the car would be avail and i was assured it would. My daughter drove 40 miles to pick us up and another 40 miles to the car dealer. When we arrived i asked for the manager but was told he was with another customer. I told the salesperson i was there to purchase the car and was told it was sold 40 minutes before i arrived. They lied to me calling 3 days out of that week telling me the car was avail. worst of all my poor daughter was a victom of their lieing also. I felt terrible that she had to experience such decitful lies by a car dealership . It's a shame how people are victimized by such unscrupleous people. 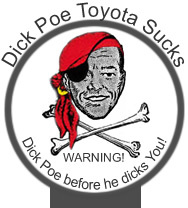 I have been a toyota buyer since 1984 but with this bitter experience will surely change to another make.